Who here likes old-fashioned aldehydic florals? I do. I love their whiff of silk stockings, champagne and evenings at the opera. I adore how tidy and elegant these fragrances are compared to my messy, cat-hair fluffed life. I even appreciate the genre’s inscrutability to the general public weaned on fruit, soliflores and patchouli. You can take it in two different ways. You could take it like a great classic — an understated luxury, that comes like a second skin. The fire under the ice, like a Hitchcock character. But because it’s a type of perfumery that hasn’t been done for such a long time, people can see it very modern at the same time, but with a wave to the past. I think much younger people could see it as very novel — for them it’s like when you take an old brooch and wear it on a jeans jacket. Sounds good, doesn’t it? Who doesn’t want to come off as Kim Novak? After wearing Superstitious a full week, I found a lot to enjoy. But, in the end, my credit card stays in my wallet. The Frédéric Malle PR machine has been busy sharing the Superstitious story. 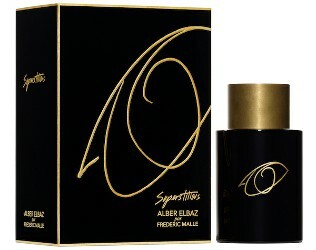 Malle had admired Alber Elbaz, the clothing designer, for years and finally approached him about doing a fragrance together. When Elbaz agreed, Malle poached a work-in-progress from perfumer Dominique Ropion, which Ropion then fine-tuned for Elbaz. Superstitious’s notes include Turkish rose, Egyptian jasmine, peach, apricot skin, labdanum resinoid, sandalwood, Haitian vetiver, patchouli and musk. Superstitious has a classic structure, starting with top notes zinging with bergamot and tart with green notes. It’s as fizzy as a shaken Fresca, even as its jasmine, peach and rose heart surfaces. Sometimes, the jasmine wafts a hint of funk. The peach is dry, not Bellini-juicy. The fizz persists. Finally, the fizz and the floral heart make room for the fragrance’s sandalwood-vetiver-musk base to muscle in. And “muscle” it does. It’s assertive. Somehow, Superstitious’s heart seems to start yelling to keep up with the base notes, and the peach and almost lemony jasmine strong-arm orange blossom to join in. Now the fizz has morphed into a cat’s tongue inside my nose. I’m fatigued, and the fragrance hasn’t even settled. Superstitious was to be, as Elbaz told British Vogue, “the perfume of a dress, the silhouette that lingers after a woman has left the room.” I understand the bit about lingering. Not that the fragrance lasts unusually long — the main part of the show only goes about three hours before relaxing into a day-long whisper of wood, vetiver and musk. But before it settles, it packs potentially disturbing sillage. Dab it if you're planning a lot of time in elevators. Wearing Superstitious next to Chanel No. 5 and Amouage Gold Woman helped me to understand what felt off balance. Compared to Superstitious, No. 5 smells more of rose and powder, and its vibe is creamier. No nose burrs here. Gold Woman, which I’d always experienced as the Hallelujah chorus of aldehydic florals, smells positively langorous next to Superstitious’s persistent chattering. For me, the clincher is the price. 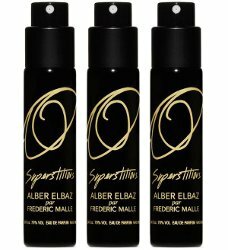 Alber Elbaz par Frédéric Malle Superstitious Eau de Parfum is $255 for 50 ml and $370 for 100 ml (it is also available in a 10 ml travel spray for $72, or a trio of travel sprays, shown below, for $180). As someone in a Mickey Spillane novel would say — a novel in which the dangerous, spoiled dame might wear Superstitious, by the way — that’s a lot of lettuce. By contrast, Amouage Gold Woman Eau de Parfum can be found for as little as $150 for 50 ml online. A full ounce of Chanel No. 5 in Extrait is only $325. For the kind of money Superstitious asks, you could fill a swimming pool with Faith Hill Eau de Toilette (don’t knock it until you’ve tried it). I’m glad Frédéric Malle added Superstitious to its line-up. I hope it’s the leading edge of a wave of new aldehydic florals. But it’s not the one for me. Please comment if you've tried Superstitious, and especially if you like it! It’s been a while since I smelled the Faith Hill, but I remember being impressed! Sometimes “not a scrubber” is a revelation! I am going to try it, as I love aldehydic florals, Gold in particular. Pity though that this one fell short of your expectations. Mind you, the drydown of Gold is more or less unbeatable. I know–I really did set Suspicious up against the gold standard. (Pardon the pun, ha ha ha.) I really would love to know what you think of Suspicious! I’m in love with either your Autocorrect or your wit! “Suspicious” indeed. I’m simply too clever for myself. Not. But thanks! I will let you know once I try it. It may take a while, I have to travel to try a Malle. And I love your pun. Gold is just wonderful. I’ll be waiting….but no rush, of course. Can I be really rude about this fragrance? Bear in mind that I’ve only tried it once, both on paper and on skin. If I were polite I would call it a bit too busy, however my first instinctive reaction was: Hot Mess. Thanks for stopping back! Well, you just saved some serious money. This really seems to be a fragrance that divides opinions. I I really want to try Superstitious and I am glad to read that it’s not bad at all! It’s really about time classic fragrances take the center stage again. But it’s so true that for the price point, I can fit quite a few options above it on my buy list (if it does end up being on it). I was super excited to try it for exactly the same reason. Ahhhhh… your review made wiiiiiiiiiiiissssssssssssssshhhhhhhh… I had a sample right here, right now, to just try and get it over with. Despite your faint praise, I suspect I will enjoy this one… odds are I won’t ever own a bottle though. At least the Malles are getting easier to find. I hope you get to sample it soon! Hi – I have a small sample that I would be happy to send you. Click on my screen name to get my email and let me know. Wow- that is truly luxury pricing! This sounds like a true ‘must love’ for the price- I am going to treat myself to a fragrance set (Eau de Soir) at more than 1/2 the cost and it will probably last forever. I would like to have the opportunity to try it, though- I just don’t know where in PDX you would find this. Fumerie? Fumerie doesn’t carry Frederic Malle (although they have a lot of fabulous brands). I think the closest to Portland these days is the Barney’s in Seattle. But now that the brand is owned by Estee Lauder, I have to wonder if it won’t be popping up elsewhere, too. FWIW, both the Bellevue Square and Downtown Seattle Nordstrom stores now sell an edited (12?) selection of FM, as does their online store. Not sure if this is included. I wouldn’t be surprised if they show up at the Portland Nordstrom eventually, then. Neither will I- the downtown PDX Nordstrom’s has a Le Labo and Killian kiosk now. Hey, thanks for the heads up! In any case, an opportunity for a road trip never hurts! I love an aldehydic floral, but the descriptions I’ve read of this one are just not grabbing me, so I probably won’t bother buying a sample. It’d be different if I lived somewhere I could test at a store, I suspect, and if I run across a tester (not likely, but possible), I’ll probably try it. Glad to see somebody making a new retro. Too bad! I’d love to know what you think of Superstitious, especially since you’re generally a fan of aldehydic florals. Planning an excursion to Barneys, so I’m definitely going to try this and report back–already have a predisposition for aldehydic florals. Also want to see if I can score samples of a few of the Vilhelms. Let me know what you think! If you get the chance, try it next to one of the classic aldehydic florals for comparison. Tried this today–one small spray, and yep, it sure does pack powerful sillage! Not by smell, but it brings to mind a modern melding of the vintage formulations of Caleche and Arpege. It really reminds me of Caleche’s soapiness. I don’t get any sweetness; honestly wonder who’ll buy this fragrance–not the La Vie est Belle/LPRN devotees. As someone who chooses fragrance by season, this isn’t a summer scent at all. Will be happier revisiting in the fall/winter. I’m interested, too, in seeing how this does. I wish I could collect demographic data on its fans. Wouldn’t that be interesting? And I’ll save the rest of my sample for cooler weather–good idea! I’ll go have a look….. This is my category! No. 5, Gold, First… I’ve worn and loved them all. I always swooned to the bubbles in Avon Charisma – so festive! I am superstitious of Superstitious, however. Or maybe just a “little stitious”, as Michael Scott would say. Sounds like a neti pot full of Cold Duck. Am I dating myself with a Cold Duck reference? Oh well, at least I’m dating. Hey Anne Meara, can’t decide which is best: a neti pot of Cold Duck, or ‘at least I’m dating’! I tip my fantasy glass of Blue Nun to yah while wafting Charlie…???? I think Mateus slots in right about here, if it rings a bell. I love criminy. I plan to start using it ASAP. I’ll grab a bottle of Lancers rosé–save your candles for later. I would like a little Blue Nun! I will join you and date myself in Boone’s Farm Strawberry Ripple. Reunite on ice? That’s nice! Gosh, I actually wrote “in” instead of “with.” But come to think of it, “in” might be more accurate. What? Did we drain the Annie Green Springs? I love this! And I suspect that “neti pot” and “cold duck” have never before shared a sentence. Or a nostril!Rings a bell? I’m shaped like the bottle. Mateus was impressive. Spanada or Tyrolia if there was a gang. By a gang I mean one other person. I tried to respond to each of you and they all ran into what sounds like a drunken rant. I’ll step out after the closed curtain to say thank you! And feel free to leave a donation in the hat. You guys are killing me! I’m pretty sure I drank every single one of those back in the 70s. I’ll add Lambrusco to the list – if it weren’t for my bad taste, I’d have no taste at all. Now it’s beginning to sound like a Rodney Dangerfield skit! Before I even tried it, I had a feeling I would love it-just from the description. And from my first sampling, of course I did! As a huge rose lover, the jasmine/rose combo is wonderful. I have no problem with the musk either. When I initially checked the price, it seemed to be in line with Portrait of a Lady. But I could be wrong. Unless I have a serious change of heart, it’s joining its Malle siblings on my dresser. ???? That’s fabulous! The gold and black bottle will look great in the line-up. Thanks for your review! I’ve been hoping to see one here. I tried it last week and also felt like it was too much for me. I got a lot of bitter funk from it-yes, BO-and a fancy French soap vibe. It lasted through several hand washings! I could appreciate it more than wear it. I just get the fancy soap and no BO or raunch at all. Vaguely roses? I sort of like it but then think its too soapy. I didn’t get funk every time I wore it, but I did get it fleetingly, but often enough, to decide it was a by-product of the jasmine. And even though I don’t believe scents have a gender I don’t think I’d be comortable wearing an aldehydic floral. Because their connotations are very feminine. The name is a minor peeve for me. I hate superstition. Superstituous people say they don’t believe in magic but they actually do. Superstition is a very negative type of magical thinking. You’ve given me something to think about! I guess I never really pondered what superstition is. Yes, it really does seem to be magical thinking. And, I adore La Myrrhe. If I like the perfume, I’ll tell myself the name refers to the old R&B song. If we’re chiming in on the name (before having smelled it), I’ll add my thumbs down. It also has me wondering if English language names for European perfumes is a trend? IIRC, the recent Prada releases also have English language names. An interesting observation! Someone could probably do a doctoral dissertation on perfume names. I tried it from a teeny dabber vial yesterday. I liked it and didn’t feel like it was too animalic at all. I checked First in Fragrance and with the VAT suppressed for export to the US it was €218.49 for 100 mls, however there is a $60 shipping fee if you order less than €650, but it’s still cheaper than $370 and if people pooled their orders it could be under $250. I’m definitely up for order pooling. I tried it over the weekend. The SA at the small Upper West Side Barney’s gave me a sample in a small atomizer, and I will test and hopefully share with a few others later this week. The rose is detectable throughout to me – the ” big” did fade after about three hours, but my initial impression was positive. I sprayed some on my daughter who complained about it being on her skin after showering! I had a similar experience with longevity–once the main show was over, the third act went on for a long time. Superstitious is way out of my financial reach, but I do have a jeans jacket and several vintage brooches so I will start experimenting! Today I teamed the jacket with a scarf made from pieces of up-cycled wool and felt, and several spritzes of vintage Dioressence. The odd cat hair is probably somewhere in there as well. Happy. I like the sound of all of it, from the cat hair to the Dioressence (which seems like a workable combo, really). Thanks for the fair warning, Angela! I do want to sample this, but perhaps I’ll try it on a scent strip first. I find some of the FMs too blunt to begin with, and this sounds like it may be one of that contingent. I also find that today’s woody base notes often exhaust me – another reason that your presumably somewhat older Chanel No. 5 and Amouage Gold might smell better, especially in the drydown. Even a modest, non niche fragrance from the 90s, like the Krizi Moods Uomo (1989) that I was testing yesterday, can have a fantastic drydown. I know Moods Uomo wouldn’t smell anything like that if it were created today. What ARE those blasted woody aroma chemical culprits, and how do we get them off our lawns? I know what you mean by “get off my lawn”! I hate that, too. Fortunately, I don’t get that awful woody-musky thing from Superstitious. I am going to keep an open mind on this one but frankly, I am skeered to try it on skin given reports of funk, B.O. and skank. You seem to like it based on my interpretation of your review. At what price would you be willing to pay for one of the travel sprays? I get no skank at all. Zero nadda zilch. So at least give it a sniff. I might just be a weirdo though. There’s hope for me, then! I will likely go to that shindig at the FM boutique. The skank I got was fleeting, and I really feel it was a trick of the jasmine’s indole. I enjoyed sampling Superstitious, but, really, I’d rather have more Gold. I feel like I am smelling a different perfume than other folks! It’s aldehydes and cleanliness, maybe a little too much of the latter. I love the bottle though! I felt the orange blossom clean feeling kick in, but it never felt overly clean to me. Still, perfume can play differently on different people’s skin for sure! $204 and $296 are Shop France’s prices for Superstious. She leaves on the 13th for Paris. A much better deal! I’m sure she’ll fly first class and drain the purser’s cabinet of Dom Perignon as she travels. Ha! Well, I will be crunching crushed ice in my Kia Soul if anyone needs me. I’m kind of relieved, satisfied that this one is not a love for u Angela, my list is rather full of expensive perfumes, and Fleur de Cassie is the aldehydic floral I really want to add to my collection, and it’s quite a bit cheaper, phew!, it will probably be another 6 months – a year for this one to join the collection. Of course I’m still looking forward to trying it, but hope I won’t love it, I don’t feel in such a hurry now, any how! It really is a strange mix of disappointment and relief when a fragrance isn’t true love–especially an expensive fragrance! I adore Fleur de Cassie. Yes, that’s truly how I feel now, always really look forward to you’re reviews, and excited if u love the perfume, but great relief if a new lemming isn’t created! I think my perfume collection is a really nice size now, and I don’t want it to get too much bigger, and there’s still so many older perfumes, including a few Malles I still need to sniff. Fleur de Cassie is wonderful, I have a few spritzes left that I must use up this spring! Spring is perfect for Une Fleur de Cassie! Well I don’t consider myself an aldehyde or floral type of person (though I love No 5 extrait and as long as it’s not actually on my skin, I love White Linen too) so I wasn’t interested in this in the pre release build up. Imagine my surprise when a desultory spray on a blotter led to immediate dousing of self with the tester bottle in Libs. I love it. I love the zingy opening and the jasmine is gorgeous but I love the vetiver/labdanum/incense base notes too. I had over applied so it was very persistent but I am looking forward to a more discreet application from a decant I’ve ordered. I think they nailed their stated concept well. That’s amazing! Maybe this is the floral aldehyde for people who don’t normally like them. Thanks for weighing in! I had a similar reaction upon first smelling but did purchase Superstitious. Today is sultry, muggy and drizzly. I sprayed on Superstious bound and determined to see if I had the same reaction. Wow how it changed with and humidity into a glorious perfume! That’s fabulous! Thanks for chiming in. My husband managed to snag a free sample in Burlington Arcade on his way home from work! First impressions were good, I thought I was going to love it.. But no, I think like u Angela, it didn’t really go anywhere I wanted it to, and then settled into bland dry down after a few hours. Thanks for coming back to weigh in! I find it’s always nice to be able to sample something, even if I end up not being wild about it, because it helps define my taste that much more.